I am so thankful Family Friendly Gaming purchased a copy of Valkyrie Chronicles Remastered on the Playstation 4. This is a strategy role playing game shown in the third person viewpoint. The player takes their turn and then the enemy takes their turn. Players can only move so many characters and/or vehicles in a turn. The same character and/or vehicle can be moved in the same turn if that is your choice. 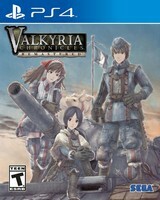 There is something odd about Valkyria Chronicles Remastered. In other countries it earned the sixteen and older rating. Which would equate to the ‘M’ rating in America. Yet the ESRB gave this game a ‘T’ for thirteen and older rating. This discrepancy is strange to say the least. There is plenty of violence, blood, and death in Valkyrie Chronicles Remastered. If you can get to one of your dead characters (within so many turns) a medic comes in and rescues them. There is also enticement to lust, lack of attire, bad language, attacks on Biblical marriage, animals given the same rights as humans, and more. Grinding is required in Valkyria Chronicles Remastered. Playing the skirmishes will grant you more experience and money. That is spent on the different character types (scouts, shock troopers, engineers, snipers, lancers are the base types) to level them up. Upgrades to the tank and weapons for the characters can also be purchased. Chapters in Valkyria Chronicles Remastered are long. We watch multiple cut scenes that are grainy. Then we get a mission brief where we have to fight. Players pick the team they want and deploy them. One of your medals can be used to retreat a character, and bring in a reinforcement. Expect it to take an hour or more per chapter in Valkyrie Chronicles Remastered. The storyline in Valkyria Chronicles Remastered is pretty typical for a game written in Japan. Big bad empire attacks a small nation over resources. You are the small nation fighting them off.